Euthanasia Roller Coaster Designed To Kill Passengers. The Euthanasia Coaster is an art concept for a steel roller coaster designed to kill its passengers.In 2010, it was designed and made into a scale model by Julijonas Urbonas, a PhD candidate at the Royal College of Art in London.The coaster reaches a height of 510-metres(1,670 ft) (0.317 mile),which would take two minutes for the 24-passenger train to reach.From there, a 500-metre (1,600 ft) drop would take the train to 360 kilometres per hour (220 mph), close to its terminal velocity, before flattening out and speeding into the first of its seven slightly clothoid inversions. The gravitational force put on the passengers by this ride is 10 Gs, enough to kill a person.The Euthanasia Coaster would kill its passengers through prolonged cerebral hypoxia, or insufficient supply of oxygen to the brain.The ride’s seven inversions would inflict 10 g on its passengers for 60 seconds – causing g-force related symptoms starting with gray out through tunnel vision to black out and eventually g-LOC (g-force induced loss of consciousness). Depending on the tolerance of an individual passenger to g-forces, the first or second inversion would cause cerebral anoxia, rendering the passengers brain dead. The idea behind this roller coaster is to give people a chance to have a lot of fun before they die. 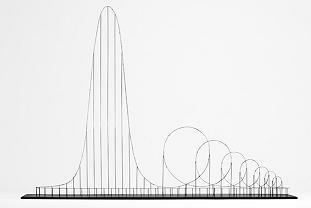 Currently, the Euthanasia Coaster only exists as a scale model, and there aren’t any plans yet to begin construction. Previous article “Erotomania” Is A Delusion Of Love. Next article 10 Interesting Facts About Human Muscles and Bones. “Erotomania” Is A Delusion Of Love. 10 Interesting Facts About Human Muscles and Bones.